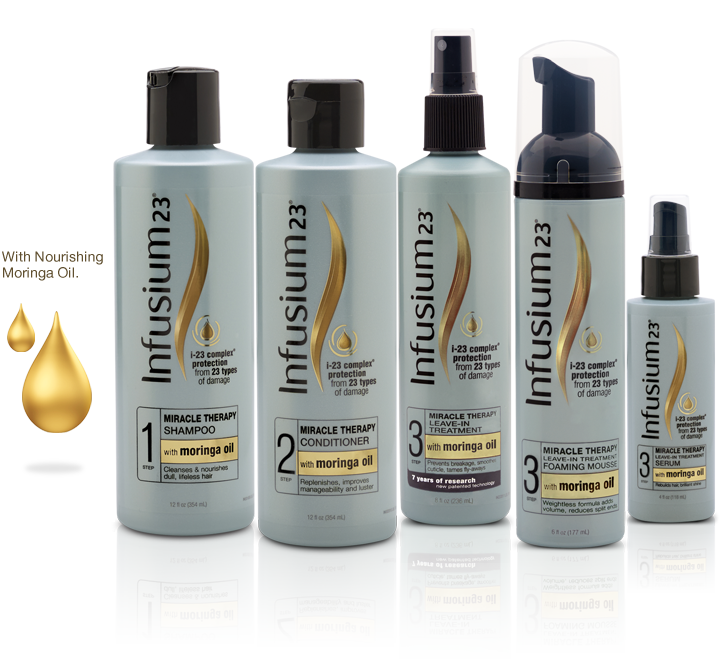 I'd like to introduce the new Miracle Therapy Collection from "the problem hair experts," Infusium 23. The brand's first product launch in three years, this line features a key formula ingredient, Moringa Oil, derived from a nutrient-dense plant native to the Himalayas and revered for its healing properties. The Miracle Therapy collection includes five SKUs, two of which are completely new applications of the leave-in treatment that can also help with styling -- a foaming mousse for volume and a foaming serum to tame flyaways. I was sent samples of the Miracle Therapy Collection to review. After washing my with the luxurious shampoo, I leave the conditioner in for about 2-3 minutes while shaving my legs. I rinse it out and then towel dry. I usually use the foaming serum on my hair while it is still damp, followed by the leave-in mousse. What I love about the leave-in spray is that I will use that in between shampoos to refresh my hair and add vitality. After using Miracle Therapy products for over a week, the condition and texture of my hair is miraculously improved from damaged,dry and dull to bouncy, healthy and lustrous. I cannot even see my split ends any more. My hair is shiny and beautiful. I'm in love! I work at Fred Meyer store and can no longer get my shampoo and conitioner unless i got to walgreens or walmart. Im very upset about this. I have nateral curly thick hair. This product is the best on my hair. I have gone to two walmarts and a walgreens in one trip to find what i am looking for. Why is this so hard to find? Do u have a way to buy online? Why is it not more wide spread.